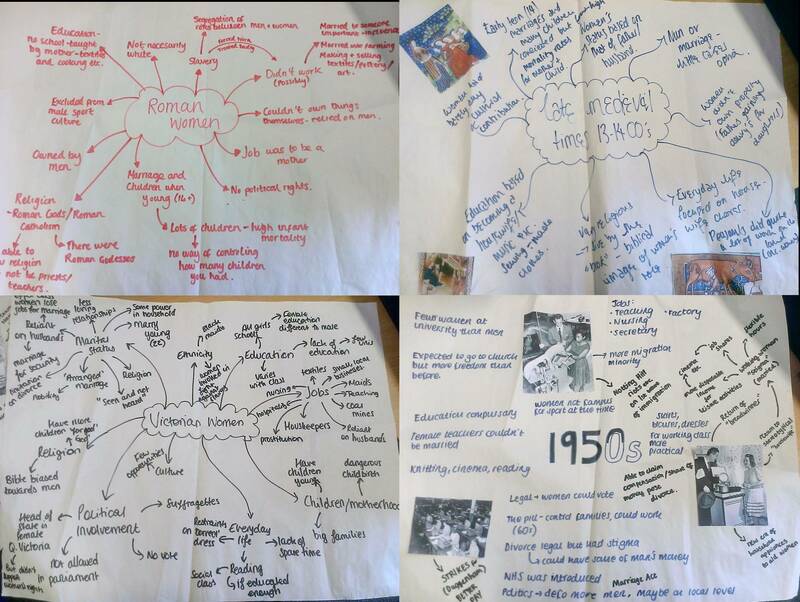 In this post, sixth-form student Katherine Holmes shares her thoughts on the Moving Beyond Boundaries project and women’s history. The women’s history project during our Personal Development Programme every week has been absolutely brilliant in opening our eyes to such a significant (but mainly unspoken) part of our country’s (and the world’s) history. Our perceptions on the role of women in history is primarily based on stereotypes and uneducated inferences that women have been merely passive witnesses in the building of our current society, and it was only men who really made any impact. A lot of us aim to excuse this by relying on the idea that women had limited opportunity. However, the project has taught us that although this is partly true, women did a lot more than we first assumed. These false assumptions can be argued to be a result of how women are represented on the curriculum, with us knowing lots about influential kings, prime ministers, archbishops, male scientists and authors etc. but little about not only influential women as individuals (e.g. Mary Seacole, Marie Curie etc. ), but of the gender as a whole. We were extremely surprised to learn of the Georgian political protesters, as the only thing we are taught about the role of women in politics is the movement of women’s suffrage in the early 1900s, and even then this topic is separated and highlighted as an exception and is only about their fight for equality, not the influence they have had throughout history and how they helped shape society into what it is today. Thank you so much for such a great opportunity to see women’s history from a completely different perspective, and as someone personally wanting to undertake history at university it has provided me with a fantastic experience to talk about on personal statements and interview which is directly relevant to the course. 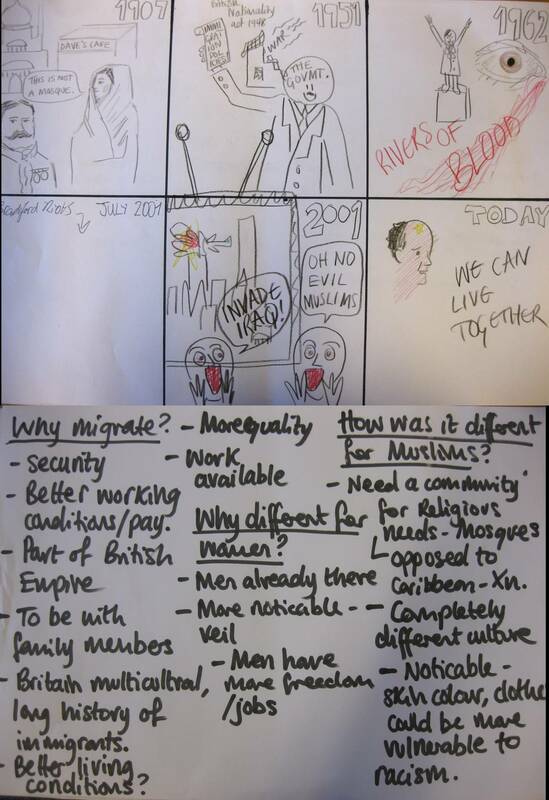 In this post, project organiser Bridget Lockyer reflects on the final session of Moving Beyond Boundaries at Huntington School. In the fifth and final session at Huntington School we wanted to do more than just recap what the students had learnt over the last few weeks and ask for their feedback. We wanted to directly tackle the prevailing view from the first session: that the general absence of women’s history in the curriculum was not deliberate, but merely a reflection of women’s minor role in history. The general consensus was that women in the past had been so oppressed that they were completely prevented from taking part in public life and were largely absent from what the students regarded as ‘important’ historical events. This session’s focus was to show them how some of what they had learnt in the three workshops had not only challenged this view, but had asked them to rethink what ‘important’ meant. The first activity evoked a theme which we had explored in-depth over the last five weeks: the ideal vs the reality. 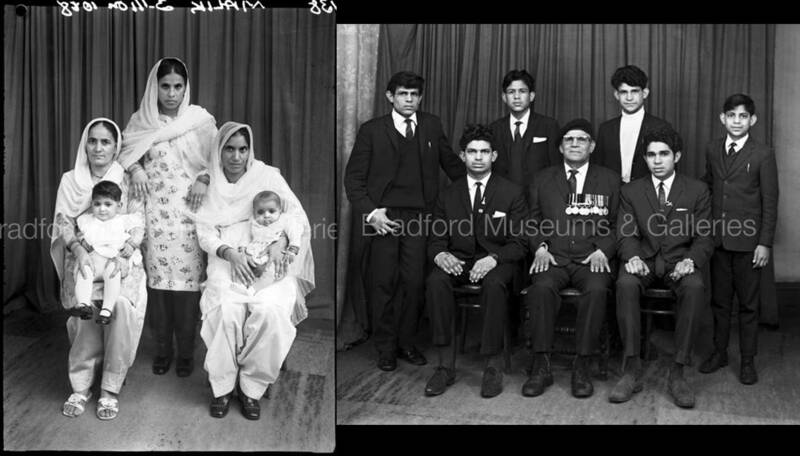 We showed students a ‘stereotypical’ image of women from certain periods in history e.g. the 1950s housewife or the medieval courtly lady, and contrasted it with some alternatives e.g. a migrant factory worker or a female blacksmith. This short activity was designed to remind students that alternative histories of women are not difficult to find if you look for them and that it is important to look at where stereotypes come from and try to go beyond them. Next, we asked students to work in groups to produce a poster summarising some of the things they had learnt over the course of the project, including five things they were most surprised and most interested to learn. 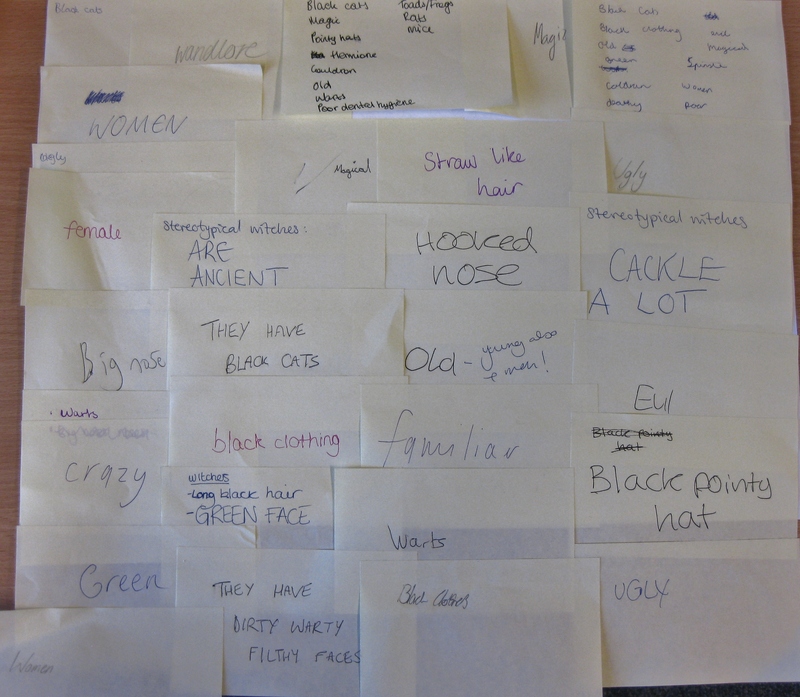 This was a great way of seeing what the students remembered, and what they had valued the most. Similar themes emerged from the posters which the students presented in groups. The students were surprised to find out about women’s role in political reform and protest in the Georgian era. The figure of the ‘witch’, discussed in both the first and second workshops, had obviously resonated with the students, and they were interested to learn how the witch stereotype had emerged. The medieval workshop had also had a big impact, largely because the students had done so little medieval history before, so knowing more about women’s lives in this period was particularly illuminating. The students were also interested to find more about migration in the 20th century and the experiences of women specifically and how they differed from men’s. For our next activity we gave the students a quick quiz which contrasted the rights and status of British men and women. This task was designed to address the perception that the lives and experiences of most women and most men were fundamentally different. We wanted to highlight that, certainly in legal terms, most men were also excluded from the political and social spheres. For example, we asked the students to tell us when most men got the vote (1918) and when most women got the vote (1928) and when compulsory education was introduced for boys (1870) and for girls (1870). The students appeared to respond well to this, recognising that women and men are not homogenous groups and that when we talk about ‘important’ figures in history, we are usually talking about a group of very elite men. 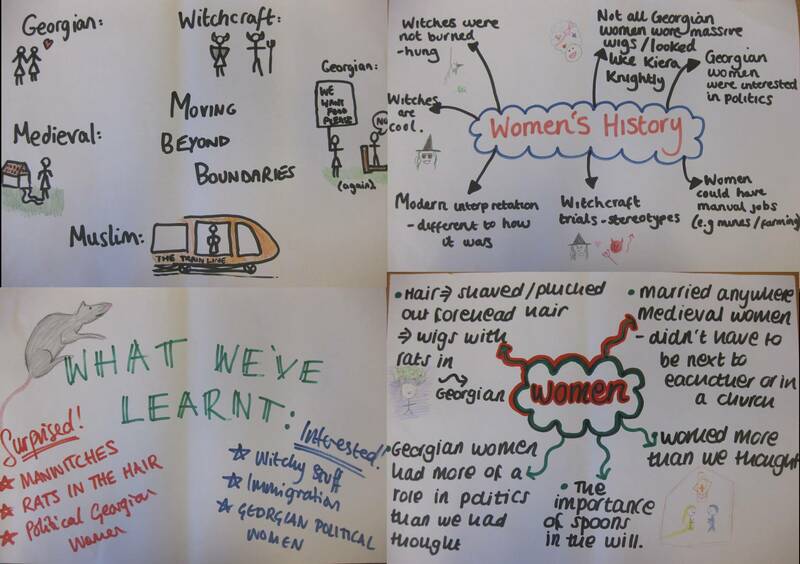 Following on from this we asked students to create a timeline to illustrate the changing status of women in Britain over the last two millennia. The timelines were not intended to be an accurate depiction of women’s ‘progress’ in history but were a tool to illustrate that women’s status had fluctuated over time. We were impressed that the students did not map out a completely linear, upwards progression, and instead used what they had learnt in the workshops to present a more complicated picture. The final activities brought the students full circle back to our first session. We played them a short video, which recapped each session’s themes, but also included audio clips of some their discussions. Once they had got over the initial embarrassment of listening to themselves talk, this was a really effective method of reminding them about what they had thought at the start and gave them space to reflect on whether or not they had changed their minds. This was also a way of showing them how much we had valued their contributions throughout the project. The students still felt it was useful to learn about ‘important’ historical events, but they were also more interested and open to learning about the ordinary aspects of people’s lives. The final remark of one student was that she had ‘learnt loads more about the daily lives of women throughout history’. I think this was the real strength of the workshops, which succeeded in showing both the bizarre and mundane, emphasising both the diversity of women’s experiences as well as the commonalities. We really enjoyed working with this bright and engaged group of students, hearing their thoughts and ideas. They certainly gave us a lot to think about as the project goes forward into the next stages. In this post, facilitator Jessica Haldeman discusses one of the aims of the session on Georgian Women, which drew parallels between the constructions of ideal femininity in this period and today. Working as a facilitator for the Moving Beyond Boundaries project was definitely one of the biggest highlights in my year so far. It’s been a great chance to share my work, continue the process of developing my own ideas, and enable others to peek into women’s history. Last week, my workshop partner Ruth Mather and I spent a few hours presenting on the topic of Georgian Women and discussed the realities of their lives and experiences. 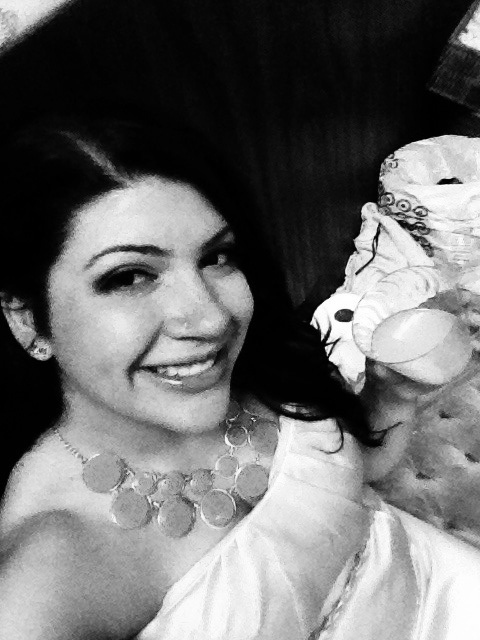 In this post, I’d like to discuss a concept that we introduced to the students: the feminine ideal. By comparing quotations from eighteenth-century conduct books with quips from contemporary articles, we were able to show the students that the notion of what makes a ‘real woman’ still applies to our lives today. By dissecting writing of the past, it allowed the students to question the messages that women are faced with on a daily basis. Samuel Richardson, Letters from Particular Friends, on the Most Important Occasions, 1741, Letter xc, p.125. Here, Richardson defines masculine and feminine behaviour. Citing masculinity as “intrepid, free, and bold”, Richardson makes femininity its contrast as something “soft, tender, and modest”. Richardson even addresses the concept of “masculine women”, stating that this type of woman has no credibility or appeal to men. These messages aren’t unique to the eighteenth century. Today, women are constantly told to be amiable, soft-spoken, and delicate from an incalculable amount of channels. Glossy magazines beckon from our supermarkets, blogs and twitter accounts advertise products in the comfort of our own homes, self-help and beauty books occupy our shelves. Sources and voices have always told women how to act, how to dress, what to think. They did it in the eighteenth century. They do it today. Participating in this project allowed us to share with the students that they don’t have to bend to expectations that society puts on them. We impressed upon the students that there’s no “recipe” for being feminine or masculine. No amount of stereotypically feminine behaviour, makeup, or clothing will ever take away who you are or add to your worth. 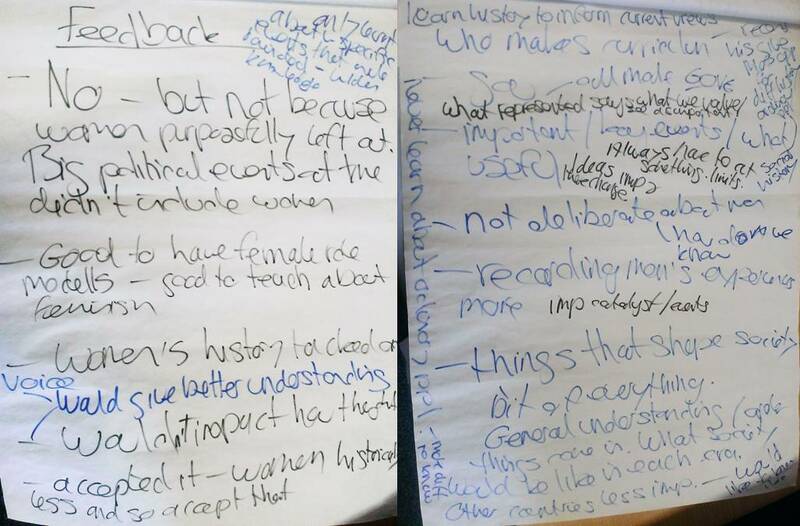 By looking at Georgian women and learning about how they navigated the slippery slope of public approval, the students began to identify all of the messages they receive about femininity and how they might be affected by society’s voice. 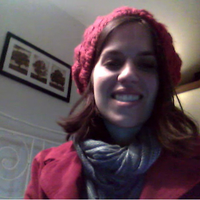 In 2011, I graduated with a BA in English Literature from UCLA. After teaching English for a year, I completed a Master’s Degree at the Centre for Eighteenth-Century Studies at the University of York with a dissertation on the social and theological connections between Baptist and Anglican women writers. 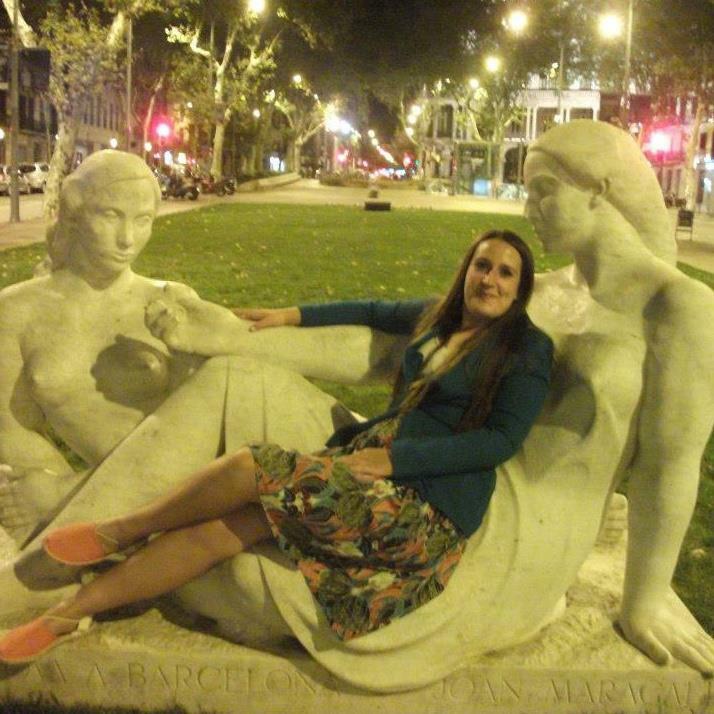 I am currently a first year PhD student in the same department, researching Nonconformist women in the Eighteenth Century and representations of the physical body in their writing. 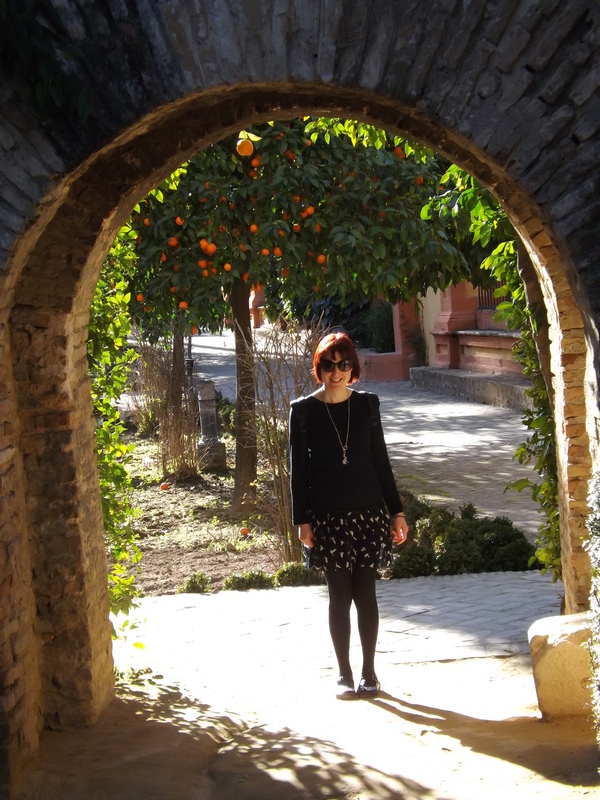 In this post, facilitator Ruth Mather outlines her motivations for taking part in the Moving Beyond Boundaries project. I was really delighted to be invited take part as a facilitator the Moving Beyond Boundaries project. The project gave me an opportunity to move beyond the boundaries of academia and to take some of my research work to a wider audience. This was challenging but highly enjoyable. I’ve rarely been able to teach my own research area before, so it was necessary to think about which ideas I wanted to share, and how to make these interesting and useful for the audience. It was useful to work with a partner, Jessica Haldeman, to pool our different areas of expertise and find connections. Since as PhD candidates we spend a lot of time focusing on a fairly narrow research area, this expanded my own knowledge of the period, as well as making sure the lesson wasn’t all about my personal preoccupations! Most importantly for me, however, Moving Beyond Boundaries is about encouraging reflection on what history is and what it is for. The crucial message is that what we choose to emphasise in our past is important for our sense of identity in the present day. As a feminist historian, I therefore find the continued dominance of elite white men on the curriculum troubling. This had led the students, we discovered in the first session, to believe that women hadn’t done much worth remembering, although they were aware that this was due to restrictions on women participating in the kinds of events deemed to be worthy of inclusion on the curriculum. Perhaps the topics we think about need to change if we are to include women as anything other than an ‘add-on’. From my own experience, it was not until I began to work on more social history at university that I began find a history with which I could identify, and from which I could build a sense of how my place in society was built from the past. Much of this is of course down to personal preference, but I had found stories of great men and glorious wars and high politics alienating because they didn’t explain how people like me had reacted and participated. There is a place for these narratives, but they must not be the only narratives students receive, because they say that ordinary people – men too, but especially women – and their everyday lives aren’t important. It is not just great events which shape the world, but the seemingly insignificant daily routines in which we all take part, and which contribute in their own ways to the wider stories of power, resistance, continuity and change that are the essence of history. I’m proud to be part of Moving Beyond Boundaries not just because it redresses the balance in representation of women in the history curriculum, but because it encourages students to question what they are taught and why, and how this affects their views of the world we live in today. 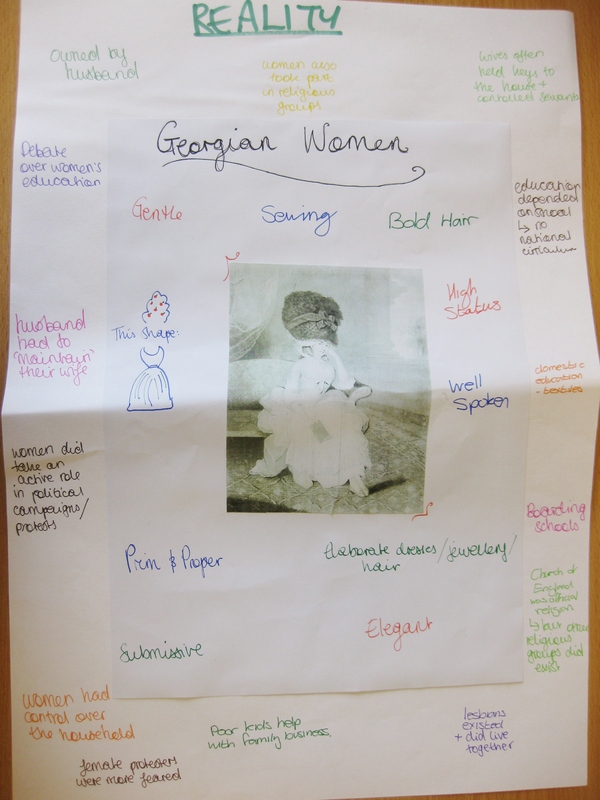 In this post, facilitator Ruth Mather reflects on teaching the ‘Georgian Women’ workshop. Our major aim for this lesson was to explore how the realities of life for Georgian women might differ from contemporary ideals or modern media stereotypes, and thus to encourage the students to consider the socially constructed nature of gender both then and now. We began with the basics though, asking the students what they knew about women’s lives in the period 1714-1830. Because we allowed the opportunity to confer with a partner, and stressed that we didn’t mind guesses, the students were happy to contribute their understandings of a period that had not featured heavily on the history curriculum. Most of the responses focused on fashion and physical appearance: they were aware of ‘big wigs with fruit in’, hooped dresses and corsets, while one student mentioned the famous figure of Marie Antoinette. This might be due to the aspects of the period that tend to be highlighted in popular representations. Media representation of the Georgian period was the next subject we sought to explore, showing a video clip from the 2005 adaptation of Pride and Prejudice, and asking the students to comment on the way that Mrs Bennett and her daughters are portrayed. 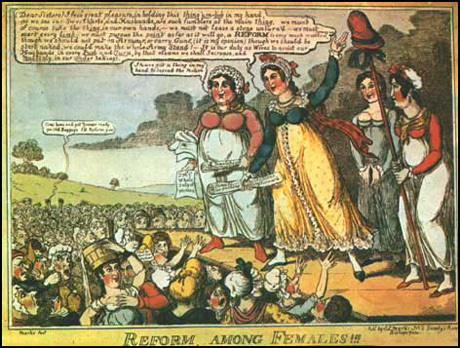 In the particular clip we used, the students said that women seemed frivolous, marriage-obsessed, and dependent on men. Indeed, the idea of dependence on men was pervasive as we moved to our next task, in which we looked at advice literature and what was expected of the ‘ideal’ Georgian woman. We began with a quick guessing game, in which we read excerpts from 18th century didactic literature and from a 21st century blog on femininity, and asked the students to guess which was which. They were shocked to find that even today women can be advised to be submissive, gentle, and quiet. Finally, the students used posters to represent the ideal Georgian woman in words and images, which were then shared with the class. Again, quietness, demureness, chastity and submissiveness, as well as fashion, elegance and an appropriate degree of education came to the fore. After a quick break, we returned to these thoughts about ideals of womanhood, and began to question the kinds of other factors which might affect an ability or desire to achieve ideals, both in Georgian Britain and today. As well as personal inclination and values, we thought about social status, education, and the views of family and friends. We should perhaps also have mentioned the conflicting demands in a lot of advice literature! Moving on, we launched a series of quickfire introductions to aspects of women’s lives, following which the students had five minutes to respond in words and pictures on their posters. This worked very well, as we were able to convey quite a lot of information in a short period. This kept the attention of the students, who were able to ask questions or request more detail in the five minutes response time, and we were pleased that many did use this opportunity. The quickfire lectures covered the topics of love, home and work, education and religion and politics. We tried to highlight variety in the lives of women, talking about difference within as well as between social groups. Contrary to the students’ expectations, they became aware that women were able to exercise agency in a number of situations: they had considerable power within the home, they could use their religious enthusiasm to travel and to speak out, and women of different social statuses participated in politics in different ways. They were also surprised to hear about cross-dressing and lesbianism, and we used this opportunity to encourage them to think about whether or not gender is fixed or fluid. In the feedback period, the students discussed how their views had changed and we felt that the session had been successful in encouraging them to think about ideals and realities of life for Georgian women. We thoroughly enjoyed the session and hope that the students did too. After graduating from the University of Cumbria with a BA in History in 2009, I completed a Masters degree in Modern History at the University of York in 2010-2011. Since 2012 I have been working on a PhD within the Department of History and Centre for Studies of Home at Queen Mary, University of London, exploring the relationships between politics and the homes of working people in England, c.1790-1830. 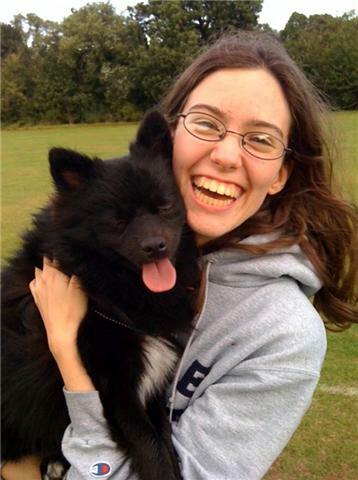 I work primarily on late-Georgian Britain, and my research interests include gender and class in popular politics, the history of the family, and the study of material culture. I also work as a volunteer with York Museums Trust and with the Borthwick Institute for Archives and am interested in widening participation in historical research. In this post, Elizabeth Biggs shares her reflections on teaching the first workshop, examining the students’ interaction with new, sometimes strange source material. Overall, I enjoyed this session and hearing about what students thought about such a distant part of the past, as well as its strangeness for them, including the lack of electricity. The session reminded me how much I now take for granted about the medieval world because I’m surrounded by books and papers that assume its peculiarities are normal. I can now identify a kirtle (a type of dress) and guess that a mazer is a shape of cup, but that’s not normal knowledge is it?We were trying to expose the students to a wide range of medieval women’s experience, show them both the constraints of their lives but also their ability to do things for themselves, exposing them to new things. We also showed them educated men being tried as witches with a woman being thought of as the driving force behind the witchcraft, an inversion from the early-modern witch trope! The students were really good with the images of Elizabeth Woodville and Margaret Beaufort, perhaps because they knew bits about them already, and because the self-presentation of each woman has been echoed in later royal images with which they were probably familiar, such as the famous images of Elizabeth I. Eleanor Cobham’s trial was difficult for my group for that exercise, not least because it’s a strange case with a lot of unfamiliar politics surrounding it, so just trying to understand what was going on was always going to be tricky. The medieval witchcraft angle, however, did seem to be of interest. The religiosity of Alice Blakburn’s will was surprising, I think, because it was so alien to the student’s experiences, whereas for me, it looked like the standard concern for the dead in the period. The students didn’t comment on her lack of living family, whereas to me, it says high mortality rates rather than simply the small families that the students were presumably imagining. They were good at spotting the value of the goods, that these were not everyday items being given away, but valuable remembrances for friends and relations. The final exercise surprised me because my group for this exercise were more concerned with the strangeness of marriage being such a casual deal and the remedies for domestic abuse than with what everyday life might have looked like. On the other hand, their suggestions were very much about things they might do, suggesting that they saw Agnes Huntington as akin to a modern teenage girl. By the end of the session, they were aware of the paucity of sources available for women, how easily women could slip unnoticed through the records until something went badly wrong and how we have to carefully stitch together scraps of information to begin to understand women’s lives in this period. I hope they felt that they learned something new about how history works, as well as how varied women’s experiences in the Middle Ages could be. I’ll be interested to see what they say about this session in the final project meeting. This week’s workshop focused on medieval women, aiming to give students an insight into the lives of four fifteenth century women. These examples were chosen because they were accessible and they drew on our own work. By choosing the fifteenth century we were hoping to use the century that the students could understand the most easily, drawing on previous work they had done on the Tudors and the visibility of the fifteenth century in popular culture. As such we began the workshop with the trailer from the recent BBC TV series The White Queen, in which the title character says very little. We were aiming to show that even the most recent work tends to see women as things rather than people, focusing on the role of male protagonists. To make this point we contrasted it with the trailer of the 1968 film The Lion in Winter which showed a woman more involved in making events happen. The students recognised that Elizabeth Woodville was not really doing anything but still saw her as central because the other characters were talking about her. Our second activity also focused on Elizabeth Woodville (painted c. 1471), comparing a portrait of her with one of Margaret Beaufort (painted c. 1550). This activity worked well with the students responding to our questions and coming up with their own suggestions about why the two women were depicted in certain ways. 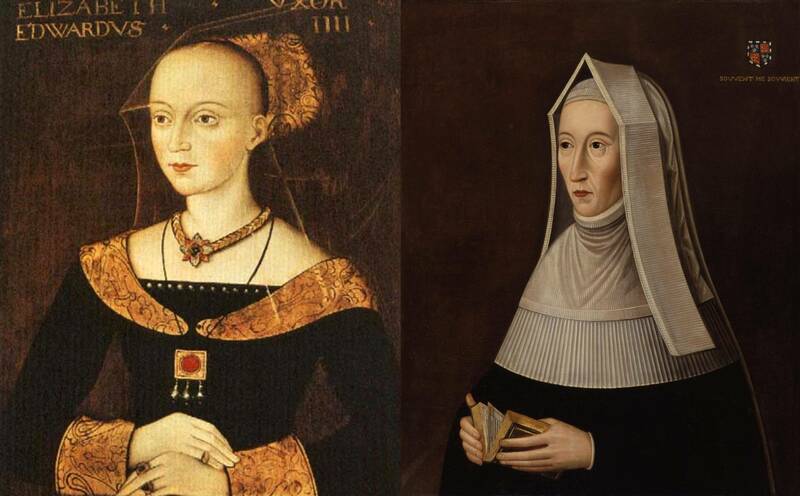 For example, why Elizabeth was painted as young and vibrant, and why Margaret presented as older, thinner and pious. The third section looked at the witchcraft trail of Eleanor Cobham, Duchess of Gloucester. 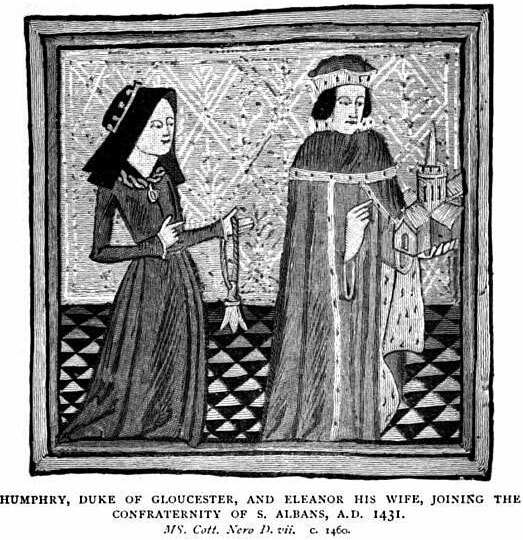 Eleanor was named as the instigator in a treason plot against the Henry VI. This case demonstrated the potential political power Medieval women wielded. The penultimate section of the workshop looked at the will of Alice Blakburn of York. This was a good exercise as it gave the students an idea of the kinds of goods that were worn and used by a woman who was not of the highest social class. 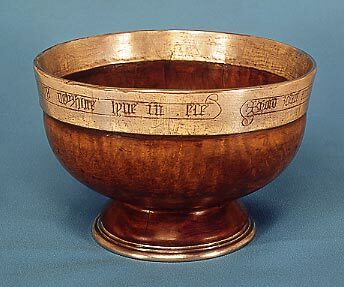 I think the details helped them to recreate to some extent an idea of fifteenth century life. If I was to do this again I would give them several wills, containing different details and ask them to compare them. Finally, we looked at Agnes Huntington. This was partly to help them relate to a fifteenth century women by giving them an example of someone who had lived in the same place as they went to school. It was also meant to show them that ordinary women did have some power and could leave their husbands if they were abused. We also hoped that it would stimulate their imaginations to think about what she would have done on a normal day. Overall, this workshop exposed the students to a selection of examples of medieval women. We achieved our aim in showing them that we do know something about the lives of medieval women and that they were not completely oppressed by a patriarchal society. 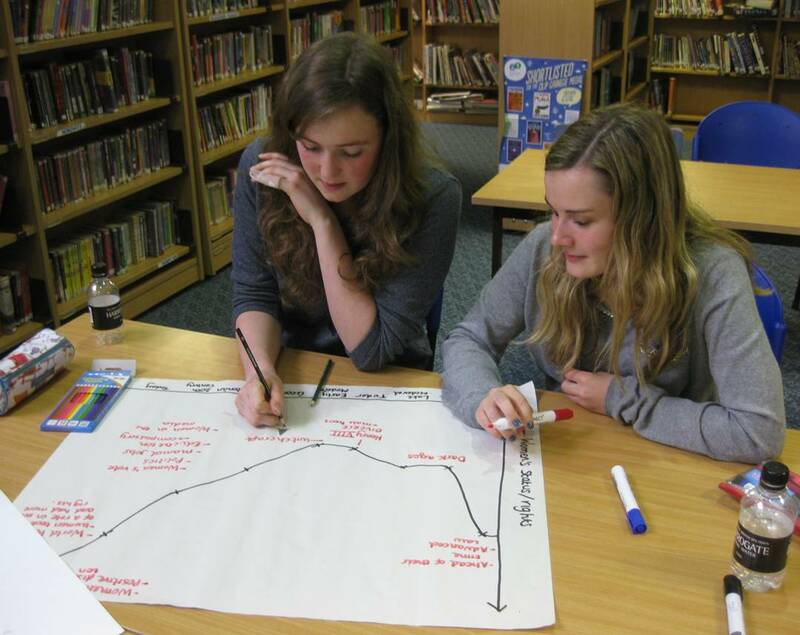 On the 26th February Moving Beyond Boundaries: Gender, Knowledge, History held its first session at Huntington School in York with twenty-five AS level students from Huntington, Fulford and Bootham Schools. In this session we introduced the project and ourselves and tried to gauge students’ current knowledge of women’s history, their experience of being taught it at school and their views on its role and importance. We were lucky enough to have use of the school library with plenty of room for group work and movement, providing an interactive learning and teaching environment. We began the session with the basics, asking students to shout out which elements of women’s history up they could remember learning about. We asked them to include any women that they had studied in subjects other than history such as English, Maths, Science, Art, Music etc. The first list was relatively short: the Suffragettes, women who worked in the First World War effort, Marie Curie, Rosalind Franklin, Christina Rossetti, Charlotte Bronte and Amy Johnson. Amy Johnson and Charlotte Bronte found their way onto the list because two of the Huntington School houses are named after them. What elements of women’s history could they remember learning about? This list was expanded after the students were asked to fill out a written questionnaire and to compare their responses in small groups. Mary Seacole, Rosa Parks, Boudicca, Mother Teresa, Elizabeth Fry and various queens of England were added to the list. A few women writers were named: Caryl Churchill, Susan Hill and Angela Carter as well as the artist Georgia O’Keeffe. The flapper girls of the 1920s and women in 1950/60s Britain also got a mention. Overall, their knowledge was what we expected, it fitted with what we had learnt from conversations with history teachers and chimed with our own experiences of women’s history at school. The students obviously had some understanding of women’s history, but this was focused around key individuals who were often presented as the exceptions. We were however very reassured by the level of engagement and contribution of all the students taking part. Both in small groups, class discussions and presentations the students were responsive, offering honest and thoughtful answers and giving clear consideration to the material they encountered. The most fruitful discussion sprung from a question about equal representation of men and women on the history curriculum. Most of the students recognised that women were less represented than men. Yet the reasons they gave for why this was the case was interesting and particularly thought-provoking for us as a team. Do they think men and women are equally represented on the curriculum? The students felt that although it was true that women were less represented on the curriculum, this was not deliberate. For them, women in the past contributed little to society. Compared to men, they had not taken part in or even been present during big, ‘world-changing’ events, and this was because they lacked the opportunities to do so. The exclusion of women on the curriculum now was just a consequence of them being prevented from doing anything worthy of note in the past. From the student’s perspective, we could not learn about a history which never existed in the first place. We were particularly struck by the implication that the curriculum emerged organically, merely reflecting the ‘truth’ about women’s position and roles in the past. We asked the students to think about who devises school curriculums and why, and that this is not an objective process. One student suggested that a male bias could emerge because most of the people making decisions on the curriculum were male themselves. Within the students’ responses there were also judgements on what counted as noteworthy and which parts of history warranted being taught in school. In a discussion about the women on the banknotes campaign, a few of the students argued that Jane Austen was less important and influential than Charles Darwin (the current face of our £10 notes). They contended that Austen had only been chosen because she was a woman, and that her actual contribution, writing novels, was quite insignificant in comparison. Here, we reminded the students that male writers had also featured on the banknotes in the past, most notably Charles Dickens. When we asked which parts of history the students considered to be important, there was general agreement that war, politics and science were the most significant. These were the things that had shaped society, and the students wanted to learn history that better enabled them to understand contemporary Britain. They felt that they should not be ‘forced’ to learn about women’s history, when, as they argued, their contribution to the making of Britain (and the world) was so limited. Again, women’s cultural contributions were sidelined, regarded as less significant. They also did not consider that the reason why they believed women had not been part of political or scientific developments was because they had not been taught about it. Not all of the students felt the same. A small minority argued that for a woman to be recognised at all given the challenges she faced, was remarkable and should be taught in schools. They also argued that women have often been written out of history, meaning that their contributions have been forgotten or undervalued. They acknowledged that women’s lives were less recorded than men’s and that in general, the curriculum struggles to cover the lives of ordinary people, only the famous or exceptional, and this was partly to blame for the under-representation of women. It was interesting that the few students who challenged the dominant view were mainly from Fulford School where they have an initiative called ‘Feminist Fridays’, a time dedicated to focusing on and learning about women and women’s rights both in the past and present. As a result, they appeared to be more open to taking a more critical look at women’s inclusion on the history curriculum. We finished the session on an activity which questioned students’ assumptions of women’s roles at different points in British history: Roman, Medieval, Victorian, 1950s and 2014. 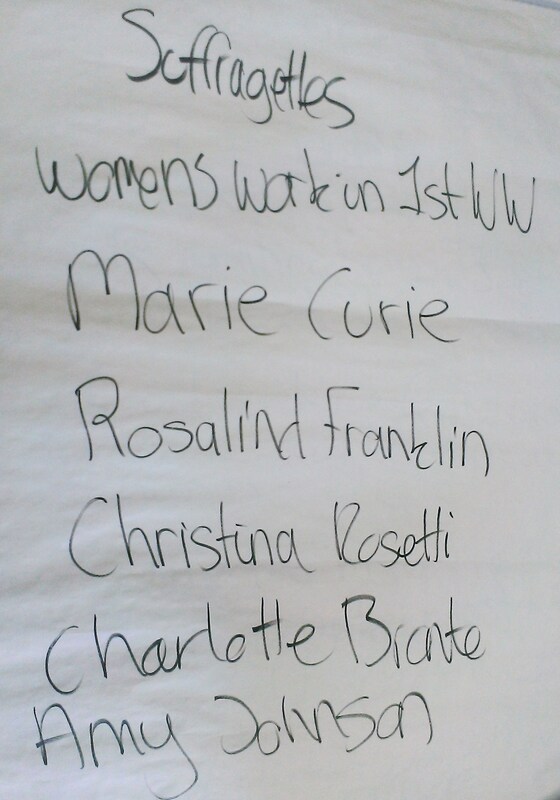 This exercise was to get students to think about what women have been doing for the last two millenia. For example, most of the groups initially stated that women were unlikely to work during their allotted time period, but on further consideration, began to list some of jobs women might have done. It is important to note that we were very keen to hear the views of all the students in this first session, and we made sure that we did not disagree or argue with their contributions. Instead, we wanted to open up the debate and encourage them to think more critically in the weeks to come. The project now moves on to the workshop stage where each week the students will engage with a new area of women’s history that they have not previously encountered. It will be interesting to see whether or not their perspectives will change.